St Louis claimed their first World Series in 24 years by beating the Detroit Tigers in Game Five on Friday. 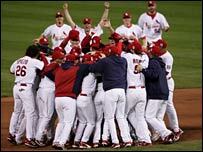 The 4-2 victory at Busch Stadium gave the Cardinals an unassailable 4-1 lead in the best-of-seven game clash. Adam Wainwright struck out Brandon Inge in the ninth inning to spark scenes of joy among the home crowd of 46,638. It was the Cardinals' 10th overall championship and went some way to erasing the disappointment of Fall Classic losses in 1985, 1987 and 2004. 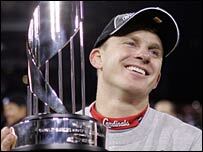 "Nobody believed in us but we believed in ourselves," said St Louis shortstop David Eckstein, who was named Most Valuable Player of the Series. The diminutive lead-off hitter - at 5ft 7in one of the smallest players in the majors - batted .364, going 4-for-5 with three doubles in Game Four and 2-for-4 with two RBIs on Friday. St Louis starter Jeff Weaver pitched eight brilliant innings, giving up two runs, only one earned, on four hits while striking out nine against his original team. The victory capped a stunning post-season surge for the Cardinals, who were hit by injuries to key players and struggled to the finish line of the regular season. Their 83 regular season wins were the fewest registered by a World Series champion. But with the return to health of Jim Edmonds, Scott Rolen and Eckstein, they came together to beat San Diego and the New York Mets in the play-offs before defeating Detroit. Victory also made St Louis coach Tony La Russa the second manager to win World Series with teams from both leagues. La Russa, who won the 1989 World Series with the American League's Oakland Athletics, emulates Sparky Anderson, who led both the Cincinnati Reds (1975 and 1976) and Detroit (1984) to victory. "I'm feeling so great for our team," said La Russa. "We went through so much. We wanted it so bad. Errors and miscues played a big part in Game Five, contested in windy, cold conditions. The Tigers, who made eight errors overall for one of the worst displays of fielding in World Series history, opened the door with a gaffe in the fourth. Yadier Molina and So Taguchi stroked one-out singles to put runners on first and second. With pitcher Weaver coming to bat, Tigers coach Jim Leyland visited the mound, presumably to advise Verlander to take care fielding the expected bunt. Weaver bunted directly back to Verlander, who hurried a wild throw to third that allowed Molina to score and put Taguchi on third and Weaver on second. Eckstein followed with a smash at shortstop Carlos Guillen that scored Taguchi and put St Louis ahead 3-2. Verlander's error was the second of the game for Detroit. In the second inning, Inge threw wildly to first trying to throw out Eckstein, whose broken-bat grounder over the third base bag scored Molina to put the Cards up 1-0. "I have no excuses," said Verlander. "I kind of pride myself on being an athlete on the mound and making plays like that. I haven't made a play like that all year." Leyland defended his players and shouldered the blame. "We don't single out any one player on this team any more," he said. "I didn't have the team ready to play the way it needed to play to win a World Series, so blame me."